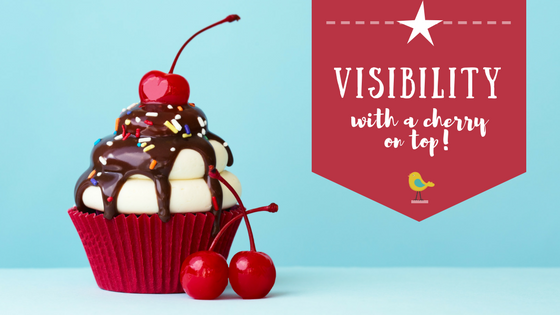 Visibility With A Cherry On Top! What’s Holding You Back from Having Your Perfect Online Presence? 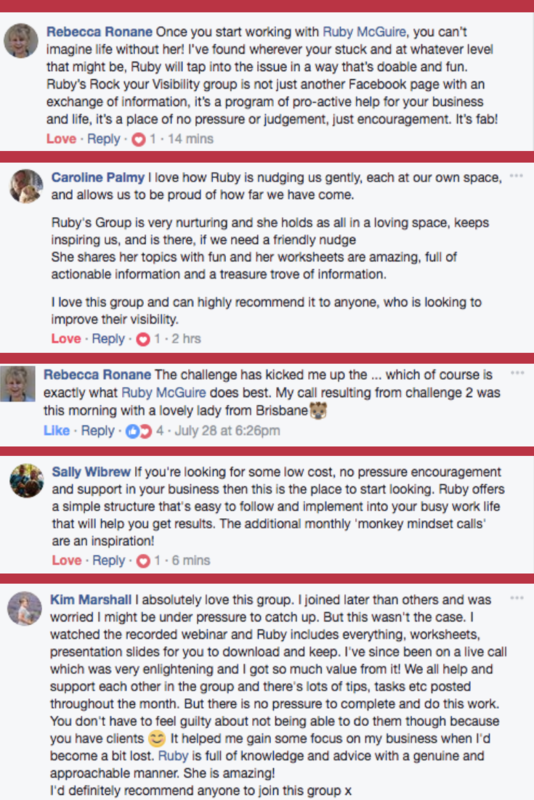 What’s the number one reason that small business owners like you are not making the most of their chances to wow, astound and explode onto the buzzing social media stage – showing off their fabulous true colours? I’ll give you a clue. It’s not a lack of technical skills and organisation. Most get up and go people who have taken the plunge into the world of self-employment are best friends with hard work and have that fantastic, energised give-it-a-go mentality. Believe it or not – the number one reason why people don’t make the absolute mostest out of the digital world is simply a lack of confidence. After all, no one knows what’s going to make your dreamie clients turn their heads in your direction. But one thing is for sure – if you aren’t being your truly amazing self on social media… then you can be certain no one will notice. This is where my ROCK YOUR VISIBILITY programme makes all the difference. Forget all those courses, masterminds and workshops that simply tell you what to do. My programme is specifically designed to give you that boost of self-belief and skills to overcome all the challenging mindset monkeys that are holding you back. And when you’re truly you – isn’t that when the magic happens? Get ready to ROCK YOUR VISIBILITY in a small, intimate group of motivated individuals – with a friendly, supportive atmosphere that gives you the space to share your wins, losses, challenges and discoveries. This programme is not another set of PDFs or videos that you simply save to your desktop to think about later. You’ll be joining other people on exactly the same journey of realisation as you. Every month we focus on one topic. Topics include list building, blogging, content creation, video, podcasts, presentation and more. If this is something you want to work on – then jump in and roll up your sleeves. And with yours truly, The Queen of Connection, keeping you on course, it’s like a coaching and mentoring service, without the high prices. Whilst most programmes simply give you a blueprint for activities, I’ll give you the plan, the belief and the energy to overcome your personal stumbling blocks. You’ll be an unstoppable social media diva with the power to amaze and attract the dreamie clients you have always wanted. What’s more, all the course content is available from day one of the programme. Jump on ahead if there’s a specific topic you want to explore or a challenge you simply have to conquer. 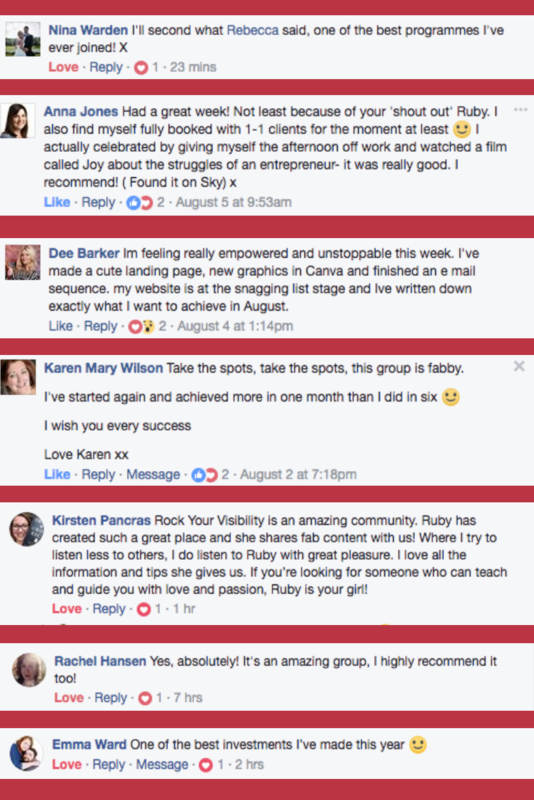 And even though I believe that consistent, regular posting is a vital step in developing the online profile that will boost your business growth – the ROCK YOUR VISIBILITY PROGRAMME evolves around you. Throughout the course, you’ll learn to measure the effects and results of each activity. Focus and double down on the platforms and content that’s working for you and stop worrying about Instagram, Twitter or even Facebook if it’s not the right place for you to find your dreamie clients. With simple actionable training, mindset tools, coaching support and much more – you’ll soon feel positive and powerful about your social media activity and output. Who Is the Queen of Connection? I’m Ruby McGuire, Visibility Diva, and over the years I have become known as the Queen of Connection. Once upon a time I was like many of you out there. A natural introvert who was scared and worried about posting online and talking about her business. Not everyone is an introvert, but the fear is real people! When I first started promoting business content on social media, I didn’t know where to begin. The trouble with this whole business malarkey is that you never know which of your million and one ideas will work. Over time I must have tried every strategy under the sun and a few that are under the moon too. This has taught me how to focus on one particular social media activity at a time to find out if it’s right for my business. Now I can give you the same skills that I have learned over time, showing you how to get the confidence you need to start sharing your ideas and create success – and most importantly how to discover the best places for you to talk to people. After all, everyone’s business is different and there is no one size fits all plan or strategy – so we can work together on uncovering the activity that shines and sparkles for you. It Sounds Fantastic. Let’s Go for It! How much do you think a programme like ROCK YOUR VISIBILITY should cost? Well to help you out I’ve purposefully kept the price low to deliver a coaching and mentoring support service without the crazy costs. Places are really limited for each round of the ROCK YOUR VISIBILITY programme as relationship building, accountability and creating a really super powerful and positive atmosphere is key to your success. I only open up 5 spots at a time as I like to connect 1:1 with each new member, and to get to know new members. Because of the need to limit group numbers, once the spots are gone – there won’t be any available until the next intake. Important Notes: The programme is all run through my Facebook group. Where you get access to all digital content when you join there are no refunds available. Training is around being visible/mindset, and does not include training on the techie side.